The primary cruise terminal of Venice is called Venezia Terminali Passeggeri. Large cruise ships tie up in the Marittima basin (Bacino Stazione Marittima), smaller ships berth at the nearby San Basilio pier and Santa Marta pier. The terminal is located to the west of Piazzale Roma. 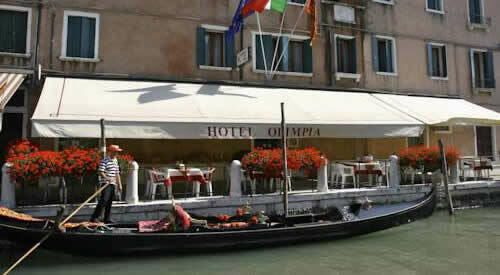 There are plenty of excellent reasonably priced hotels in Venice Italy, all within easy reach of the cruise terminals. You can choose between a reasonable priced hotel, luxury property (with views of Grand Canal), cosy b&b or apartment rental. Hotels near the Port of Venice in Italy – Where to Stay ? No mather where you stay in Venice, hotels are close to everything. Popular areas are San Marco District (around Piazza San Marco or St Mark’s square), and quieter and less touristy Cannaregio. If you want to stay closer to the ship, nearest hotels can be found in the surroundings of Piazzale Roma. The Piazzale Roma is the last point of land travel in Venice. Nearest area from the cruise terminals and place where buses drop you off from the airport. Santa Lucia train station is also a short distance away. Some establishments overlook the Grand Canal. Closest properties include the Best Western Olimpia, Arlecchino and Papadopoli. If you’re on a budget. Cheaper and more budget friendly accommodation can be found in nearby Mestre (mainland), or close to the Marco Polo international airport. Budget friendly 3 star hotel within walking distance of the Piazzale Roma bus terminal. Set in the heart of Venice, a 5-minute walk from St Mark’s Square. Great value. 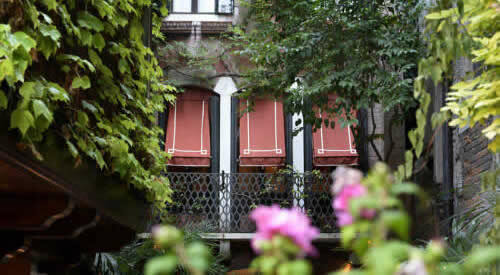 Luxury Venetian hotel located on Giudecca Island. Rooftop bar with lovely views of Venice. From anywhere in Venice you take a water bus to other parts of the city. St. Marks Square can be reached in about 10-30 minutes from all accommodations. The square is set in the heart of Venice. Sights include St. Mark’s Square, and Basilica, the Doge’s Palace, Rialto Bridge, and Harry’s Bar. Piazzale Roma is reachable by Vaporetto water bus in about 20 minutes. Cruise ships dock at the Venezia Terminali Passeggeri or Venice Passenger Cruise Terminal, situated near the 3 mile causeway that links this historic city with the mainland, Mestre. The largest vessels dock in the Marittima basin at terminals 103, 107/108, 117 and Isonzo 1-2. Smaller ships tie up at the San Basilio or Santa Marta pier in Venice’s harbour. Nearest area from Venice cruise ship terminal is Piazzale Rome, the final destination for buses and taxis that enter Venice. San Marco square is a 30 minutes stroll away. From Piazzale Roma, which is the main gateway for taxi and bus in Venice, you can take the automated People Mover (monorail) to the Marittima cruise terminals or a land taxi (if you can’t manage your luggage). To reach San Basilio you take a water bus. For cruise guests arriving in by train, it’s recommended to get off at the train in Mestre. From here you can take a land taxi to the port in about 15 minutes at a cost of approx. Euro 25. From the Venice’s main Santa Lucia train station, you can either take a taxi-boat (cost approx. Euro 60) or the People Mover from Piazzale Roma which can be reached from the S. Lucia train station on foot or with one stop of the waterbus. see also : Cruise Port hotels Civitavecchia, Barcelona Cruise Port Hotel. Venice is a visually stunning place, and is one of the most beautiful cities in the world. It’s located in the Venetian Lagoon on Italy’s north eastern Adriatic Coast. The city is world renowned for its canals, its maze of waterways, bridges, colourful narrow streets and small lovely squares. This romantic city and his buildings is built on a series of wooden poles on more than hundred islets which are seperated by canals and spanned by numerous bridges. Admire the wonderful palaces and churches on foot, by Vaporetto (water bus), water taxi or by a gondola ride, a must do experience while you are in Venice Italy. Not to be missed are the main tourist attractions such as St Mark’s Square (Piazza San Marco), the central square of Venice, and the Venetian Gothic Style, Doge’s Palace (Palazzo Ducale). Nearby is the Bridge of Sighs or Ponte dei Sospin, a famous white limestone bridge connecting the New Prison to the interrogation rooms in the Doge’s Palace. Not far from San Marco is Rialto Bridge, the most famous bridge in Venice that crosses the Grand Canal. Famous Lido, located on a narrow sandbar, serves as a natural breakwater and protects the city from the Adriatic Sea. Lido is home to the annual Venice Film Festival and the cities best beaches. Tourism is a very important industry for the city. Different Venice districts boasts a large number of hotels (cheap, reasonably priced, moderate and luxury), charming b&b’s and self contained apartments for rent. Venice Marco Polo Airport — the main international airport is located approximately 10km or 6,2mi north of Venice. From the airport you can get to the city by either land or sea. The cheapest way to get to the city is by taking a bus. Buses will take you to Piazzale Roma, a major hub for buses, water taxis and vaporetto. ACTV local buses (www.actv.it), or ATVO direct coaches (www.atvo.it). You can also take a land taxi (20 minute taxi drive away from the port, Piazzale Roma). To reach your hotel from Piazzale Roma you can continue only on foot, or with the ACTV water buses, or by water taxi. 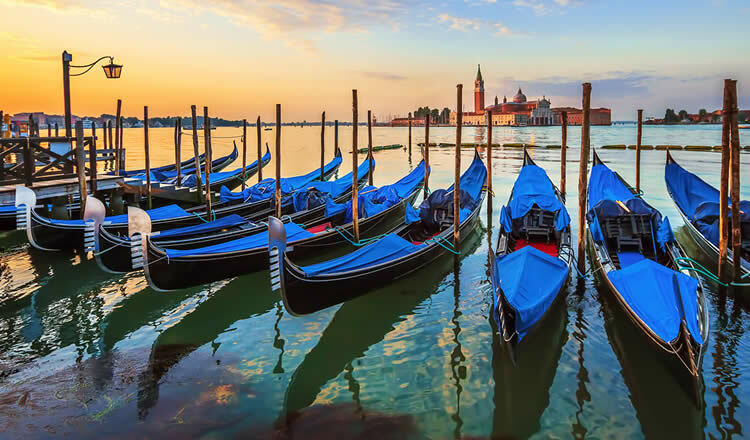 By sea, you can take a Alilaguna ferry from the airport to several spots in Venice (Piazza San Marco or St. Mark’s Square, Lido, Cruise ship terminal, etc.). The most expensive, but most luxurious option, is by private water taxi to your hotel. Treviso Airport — Treviso airport is situated about 40km or 25miles from the city center. To reach Venice city centre, you can take a bus or taxi. Major cruise companies departing from Venice cruise port are MSC Cruises, Royal Caribbean RCL, Costa Cruises and Princess Cruises.